Norman Rockwell’s classic, “Freedom From Want,” 1943, painted by him as an outgrowth of President Franklin Delano Roosevelt’s “Four Freedoms Speech” of 1941. Excuse us for living, but this Thanksgiving it seems appropriate to give thanks for “what” we have instead of the usual “all” we have. Let us remember those in need, whether it be those suffering from storm’s wrath or otherwise. And may we pray to be a true community of people working together to face the future in our towns, states and our nation. Happy Thanksgiving to the Fontana Clan! All that picture needs is a vat of Aunt Geri’s mushroom soup along with a bottle of Sherry. It’s not just for Christmas anymore…. Headed to OH for Turkey this year to give thanks for “what” we have. Say hi to everyone for us. ENJOY! All our love, Doug, Beth and Evi Doo. 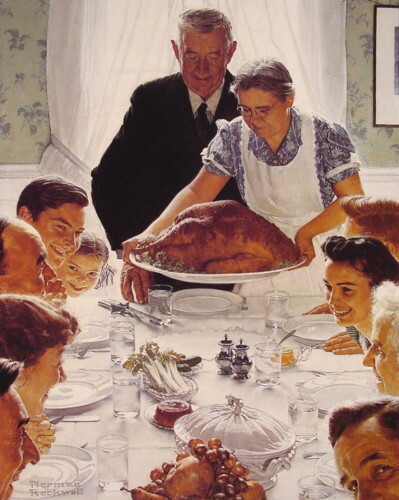 “What” we have and share are all our terrific families….our kids and grand kids……how grateful are we! Yes …….Geri’s soup has made tradition in all the Doolittle and McCann families in four different states. Happy Thanksgiving brother and love to the “Fontana Clan”. Vin! How nice to find you here & right back-to-back with Doug’s nice response!!! You are so right about “what” we have to be grateful for. And mushroom soup now spread over four states…Geri will like that…& good reason to pass around that bottle of sherry!!! HAPPY THANKSGIVING & LOVE back to you & all the Doolittles & McCanns!!! Love, Phil & Geri too! Happy Thanksgiving from sunny Florida! We’re so glad to hear your power is back on. Have a wonderful day together. Love, Jenny, Alan and the boys! Jenny & Alan & the Boys too!!! How nice of you to respond!!! And you all have a warm & cozy Thanksgiving as well! Yes, we are so glad to be back with creature comforts restored. But the downed trees everywhere that did not have to be removed immediately are a visual reminder of the devastation in the NYC area & the NJ shore that will take years to restore. And so much needs rethinking as to where & how to rebuild so that future storms will not be as devastating. Got to hear more re your pre-school & how things are going. Must ask Erin more often! Our love to all the St Jean/Krass clan!!!! Phil & Geri too! Sounds like a wonderful gathering you have planned! Jenny responded as well above!!!! So nice of her! We are “doing” Thanksgiving here for the first time now that Geri’s Mom has passed away….40 years of Thanksgiving there. Erin & Andy & all the gang will be here except for Peter’s Claire…home/family in Maine! So my “funny” is always, “Eat too much Football & watch too much Turkey!” You know where I’m coming from…Happy Thanksgiving to the Krass/St Jean gathering! We hug you all back! Phil & Geri too!!! Mike & Sharon!!! You are sure to have a wonderful Thanksgiving…What could be better than a visit to CT with the kids & grand kids!!! No, let’s eat too much!!! “Eat too much football & watch too much turkey,” I always say after too much wine!!! And so, so great to hear from you!!! Phil & Geri too!